10 PROVEN DIRECT BOOKING METHODS. DO YOU KNOW AND USE ALL OF THEM? Direct booking requires commitment and patience. But as it usually happens in such cases - making an effort pays back in great benefits. Would you like to enjoy growing sales bills and guest loyalty? Check out 10 proven methods for direct booking success! 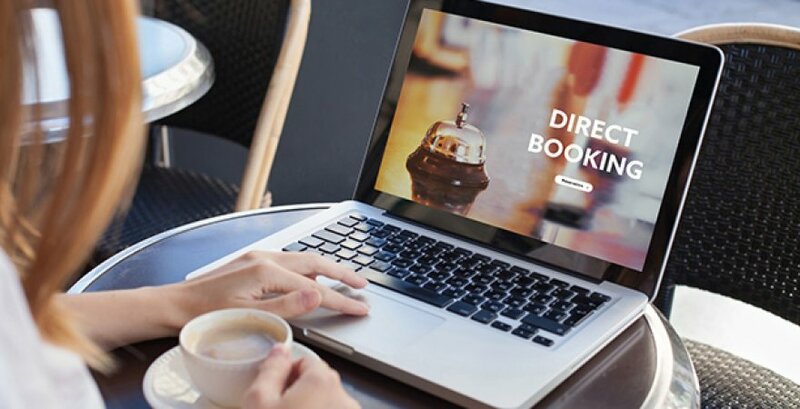 Based on the experience of hoteliers who already benefit from direct bookings, we have chosen the absolute 10 must-have direct booking strategies. Check if you use them all in your facility! Are you just starting to communicate your brand online or maybe you’d like to focus on the effectiveness of your current strategy? Think about who your target group is: business guest, family guest or maybe single people? Provide a different type of communication for each of those groups. Do you envision your object to be associated with luxury, family vacation, romantic trip or active recreation? It’s also an important question that you should know the answer to, as it makes a huge difference in the communication. As many as 86% of guests declare that their purchase decisions are made due to personalized communication (according to SiteMinder data). monitor your activities, i.e. coverage, engagement and the number of people associated with the site. You can use Pixel Facebook to do this. According to Tripadvisor, 96% of guests consider other people’s reviews to be helpful in choosing the right hotels. It is worth collecting the reviews from all channels and showing them on your website as so-called social proof that will additionally build trust for your venue. Video and photos that are used in communication in social media are worth having on your website, too. Showing a hotel’s restaurant or a SPA room will make it easier for the visitor to imagine oneself eating the chef's specialities or relaxing in the jacuzzi. E-Marketing Associates checked guest behaviour on hotel websites. According to their research, 20% of visitors are getting acquainted with the content and text of your website, but as much as 80% of the offer and object are discovered via video and photos. It’s an investment that pays off! Not only on the site, but also when choosing a booking engine, it is worth taking into account messages encouraging to take an action (so-called call to action)which in this case is making the final booking. Strikethroughs, information that an offer is best-selling or that as many as 10 people are browsing the same room at the same time, also accelerates the guest's desire to make a reservation directly through the website. Most brokers use such tricks to finalize transactions on their sites. Subscription to the newsletter, which in addition to the discounts, offers permanent commercial information, i.e. pre-sale shares, unlisted offers etc. None of us likes to overpay, so it’s obvious that visitors would be willing to subscribing to newsletters in exchange for a tangible benefit. Profitroom Suite data shows that 1/3 of guests who provide e-mail addresses to activate the discount, at the same time agree to use their e-mails for marketing purposes. Longer = cheaper discount offer available on your own site is an additional argument for making a booking directly. The right packaging, or emphasizing the benefits of a longer stay, is the key to success. The offer can be permanent or a seasonal sale. Do you know why asking a visitor to stay is asking for a date? A strong advantage of each website is the possibility of introducing a comprehensive stay offer. It is worthwhile to offer guests something more than just a bed and breakfast by using the facilities of the hotel such as a restaurant, spa, recreation area and even the surrounding area, and combining them into a stay. Romantic weekend, business stay or "SPA for friends" are just a part of ideas. The hotels which in January added their first-minute stay options to their online offer are as soon as March comes fully booked for the summer holidays! translations of descriptions, available in the English at the minimum. The simplicity of the booking path is very important. It is worth placing online booking functionality on your own website easily accessible since this is the place via which a guest will be able to make a reservation. Additionally, make sure that buttons with quick online booking are available for each offer subpage. The button for online booking should be visible when scrolling or moving to subpages, as this is the possibility of making a quick reservation and as such, it should be in always-on mode. Guests (especially those from abroad) often have preferences regarding the method of payment. Some prefer online transfers through their banks, others favour a card like Visa or Amex. It is worth adapting to the needs of guests, and you can do it in a really easy way. By integrating an online payment gate, you give your guests full freedom in the payment method. It is also a great convenience for the reception staff who doesn’t have to remember to send the account number to the transfer or to decrypt the guest payment card. According to the market statistics (HVS), European hotels from year to year note increases in the value of online booking transactions. 2017 gave a YOY 11% increase while 2018 YOY was already 14%. What will the current year bring? According to market forecasts, there will be further increases. So let's adapt to the online payment trend. Other market trend shows that guests spend more and more time on smartphones. Browsing e-mail, checking news from the world or planning holidays are the activities that we undertake more and more often via our mobile devices. In addition to the hotel website review, there is also an increase in transactions from mobile devices - year to year is about 35%. Therefore, make sure that the offer of your facility is transparent to those who love smartphones and tablets! Nowadays the discount offered by a loyalty program is often not enough to encourage anyone on its own. Guests (especially the younger generation) expect something more from a hotel. The tangible benefits such as a drink at the bar or a discount to the SPA have greater value. According to Nettafinity, as many as 18% of guests appreciate discounts on local events or local attractions. If you want a guest to return to the hotel and to book directly on the hotel’s website, make sure that the stay is pleasant and remind him/her about the experience. Thanks to such tools as Profitroom CRM you can create guest segments and send personalized messages to them, for example on the occasion of birthdays or on the upcoming holidays. In each message, you can smuggle suggestions for a next stay or add a discount for the next arrival. In addition, ProfitroomCRM gives you the option to automatically send an email a year after booking with a new proposal or a stay. It is worth keeping in touch with the visitor and not letting him forget about your hotel. Visitors increasingly need answers here and now. They do not call but use messengers. The Messenger on Facebook or instant messaging on the website has become a wow in the hotel industry. Slowly, chatbots are also starting to help hotels communicate with the visitor by answering simple questions. The faster you answer a potential visitor, the more you increase the chances of booking. Tui, Air France and Booking.com already use new technology. So let's keep up with the latest trends on chatbots. By helping the reception desk in repetitive questions, you are able to make its work more effective and efficient. Receptionists will be able to focus their full attention on the guests. Only being in constant contact with the visitors and knowing their needs, you are able to make a direct booking strategy effective. Use the above tips in your facility and enjoy the increase in booking through your own website!